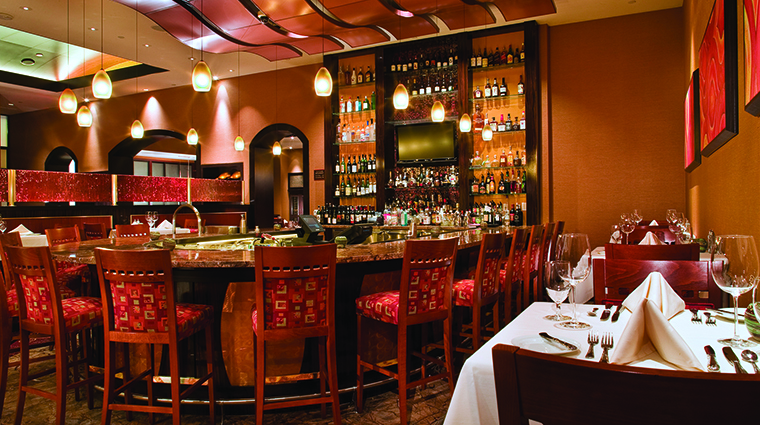 For an unforgettable night on the town in Greater Palm Springs, Lady Luck is on your side at The Steakhouse at Agua Caliente Casino Resort Spa Rancho Mirage. This fine-dining establishment offers an exquisite experience, charming guests with its luxurious ambience, aged USDA prime steaks and extensive wine list. 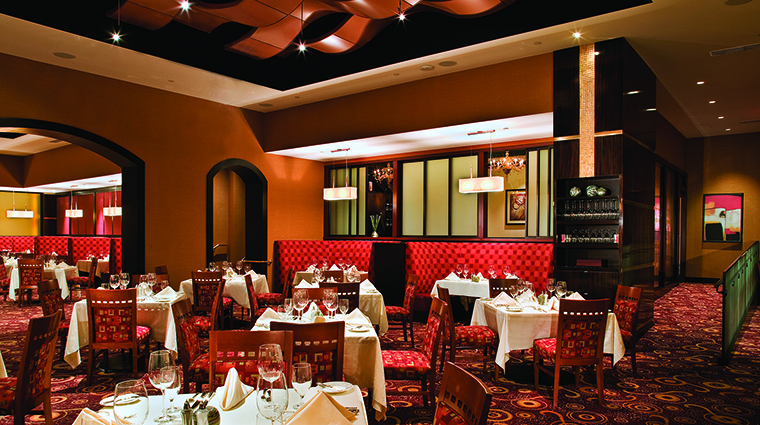 It’s hard to believe you’re just steps from a sea of casino games when you set foot into The Steakhouse, where soft, romantic lighting and dark mahogany walls with orange-red accents set the tone for a romantic rendezvous. 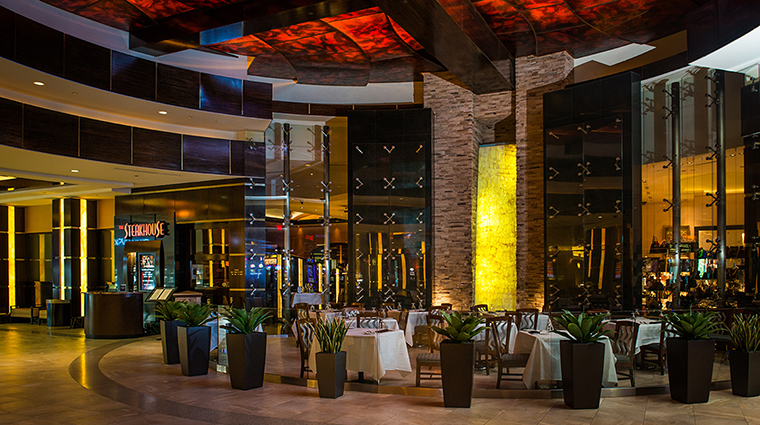 Whether you settle into one of the plush, oversized booths along the wall or share appetizers at the half-circle bar, the intimate dining room shines in its ability to make you feel as if you have the entire place to yourself. The interior’s allure is strong, but if you enjoy people watching while you dine, opt for one of the tables outside the restaurant for a front-row seat to the action of the gaming floor. One would expect meats to be a serious affair at a restaurant named The Steakhouse, and the menu here doesn’t disappoint. Every cut is hand-selected USDA prime that is specially aged for 21 days and seasoned with a special dry rub, ensuring that every bite will be unforgettable. The wine list, which includes more than 300 selections and an inventory with more than 4,000 bottles, is presented on a tablet, so you can easily sort through by-the-glass and by-the-bottle offerings by name, price or region. Reservations are highly recommended at this popular steakhouse. Call 888-999-1995 to book your spot or visit OpenTable.com. Dine on delightful steaks for dinner starting at 5 p.m. seven days a week. The Palm Springs restaurant is open until 10 p.m. Sunday through Thursday and until 11 p.m. on Friday and Saturday. Officially, the dress code at The Steakhouse is “casino casual,” so come comfortable, but not sloppy. Ladies will be comfortable in nice jeans and a blouse or a sundress and gentlemen will want to avoid shorts and flip-flops. The three cuts — New York, rib eye and filet mignon — are each given in two variations, as is the prime rib. A “Steak Enhancement” option lets you elevate the flavor with add-ons like a blue cheese crust or seared jumbo scallops, while the sides selection includes steakhouse classics like creamed spinach or a tableside baked potato. If you’re really looking to impress your date, don’t miss the Prime Chateaubriand, a 20-ounce center-cut roast tenderloin that’s carved tableside before your eyes. The steaks here are a must, but there are ample other protein choices. Some seafood highlights include broiled Scottish Loch Duart salmon and Western Australian lobster tail. If you’re in the mood for a treat from the sea, splurge on the “Surf Meets Sand” sampler, which includes chilled oysters, ahi poke, king crab legs and Mexican shrimp cocktail.